2048. It is just a number. Two-thousand and forty-eight. But it is annoying. 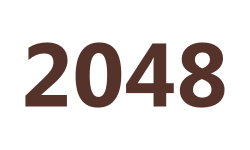 In truth, 2048 is a special number. It is 2 to the 11th power. That is 211. In binary is a one followed by eleven zeroes. 100000000000. In hexadecimal (base 16), it is 800. As such, it is special mathematically, but it is even more special in the computer world. Back in the early days of computing, having 2048 bytes of RAM was significant. Having 2K of RAM was amazing and people who had that much were bragging that their computers were state of the art. The rest of us marveled at both their buying and computing power. Today, people laugh when you tell them that. Indeed, students in my classroom think I made up the story to answer their complaints about RAM. But in reality, they have over 1000 times the memory of those amazing 2048 bytes of yesteryear. As nostalgic as it is thinking about computing in the early days, 2048 has another computer significance. It is a game. A game that I wish I had never played. Actually, 2048 is really a puzzle disguised as a game. It is a simple concept, but it is very tough to beat. In fact, for those of my faithful fans who expected to read my blog earlier in the day, 2048 was at least part of the reason I did not get it done on time. 2048 looks like one of those old puzzles where you are supposed to arrange the 15 tiles in the right order on a 4×4 grid. Usually, the tiles were just the numbers 1 through 15, but sometimes they were pictures. It was fun to play this game in the car going to Grandma’s house or when just hanging out with nothing else to do. Nowadays, you can even find variations of this game to play electronically. My first encounter with the 2048 game was trying to get my students to work one day. For some reason, it was being played on just about every computer in the room. It was as if everybody had been brainwashed into playing the game. Even my most hard working students were distracted. (They all seem to have it on their phones now too.) I went from student to student to student trying to get them to work. As I watched them not work I saw that at the lowest level, 2048 is just pushing tiles around. But I discovered that it can be a very strategic game. 2048 starts with just two tiles randomly placed on the 4×4 grid. Each of the tiles is either a two or a four. The concept is simple. You move the tiles either left, right, up, or down. Whichever way you want the tiles to go, they all go. A new tile (either a two or four) appears randomly in one of the empty spots. When two adjacent tiles are slid together, they become one tile with twice the value. So when two adjacent twos are pressed together, they become one tile with a value of four. Two fours become an eight, two eights become a sixteen, and so on. The goal is to get at least one tile to become 2048. Thus the name. When I first saw the game, I thought it was silly. When I had it explained to me, I thought it was intriguing. When I started playing it, I found it annoying. Even though I do not often play video games, I do like them. Unfortunately, when I have a new one, I usually play it to the exclusion of all else. At least until I finish it. Some people would say I do that because I am goal-oriented. Others would say I am just an addict. 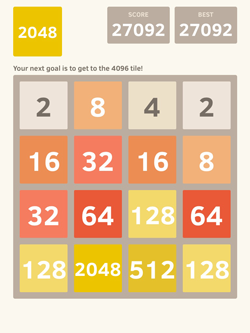 Either way, I figured I could play 2048 a couple times and finish it so that I would not need to play it again. Fat chance. The first time I played 2048, I got one tile all the way to 1024. I figured I would finish it the first time out of the gate and I would be satisfied. Then, the iPad ran out of juice. I rushed to plug it in and even tried to play right away as it was charging, but all I saw was the battery icon slowly filling with red. When I finally did get back to the game, I found it had not saved my progress. I was crushed. It was late and I did not want to try again that night. I tried again the next day. Again, I got to 1024 before losing. I got that far several times during the half week of playing. Then, I finally hit a speed bump. I only made it 512. So I had to go again. And again. And again. I still have not beaten the game, so I call it dumb, even though it is really me who is the dumb one. After all, I am the one playing it. Even though 2048 is a game, it really is just a number. Sure, it has significance in math and computer circles, but it is still just a number. So it cannot actually be annoying. But I think it is.